Those baskets are toast, replace them. 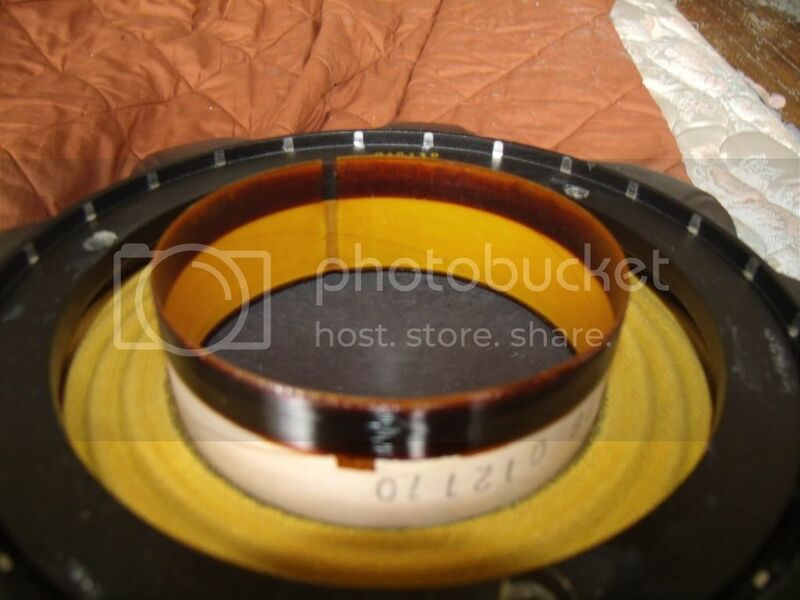 They should not be black in color, anywhere on the voice coil. When replacing, fold over some masking tape (sticky sides out) and run the tape in the magnet gap to fish out any debris that may be in there. 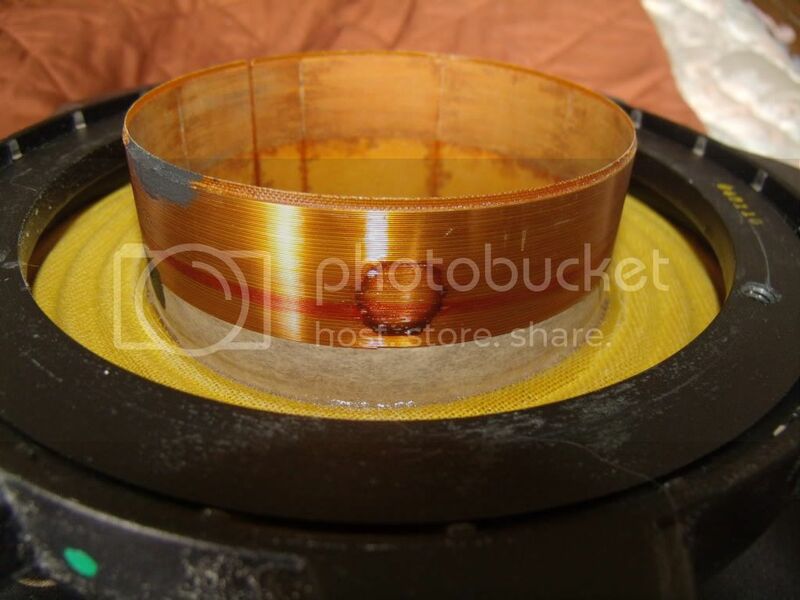 That is something I've never seen before on a voice coil. It looks like something caused overheating in a small circular area, like debris or something in the gap . I am assuming the one with the small circle is the trouble driver. Did the dealer SEE THIS? Can you give a more detailed description of the noise that the driver makes, when it makes it, with what material through it, and at what volumes. Is it a pop, or more of a scratching sound? A series of quick pops? Any distortion at low volumes?-Low bass tones at low volumes? Is this just the one driver, is the other one OK? As always, more info leads to better help. Different looking voice coils, might indicate one has been replaced already. If these are black widows, and one is driving OK, you might try swapping voice coil/magnets with baskets/cone assemblies, and see what happens. It is also possible that one coil might be a odd/wrong recone or some such, I'm not that familiar with the black widows to tell you what the coils are supposed to look like. Also, are these rated 4 ohms? The peavey dealer did not look at the coils. He's one of those guys that if you didn't buy from him he don't wanna help you. Both drivers do the same thing. A loud pop is heard when bearly powered. Have hooked it up every different way to 2 different amps. My mains don't pop at all. No clip lights come on when the subs pop. They are 4ohm subs. They're the 1808-4 sws black widows. The coil with the black circle doesn't seem to be bad anywhere else. I'm going to try to take better pics with an actual camera insted of my phone. Thanks again everyone. Here are some new better pics. They're toast, especially the one that has the black voice coil. I'm not sure what happened with the one that has a circular burn mark on it, but, that gray colored goop on it isn't right either. Don't know where that gray colored stuff came from, but it's not factory. I'm a huge Peavey user with many systems (Versarray, QW, SP) and I can tell you that they should not look like that. Time for some baskets my friend. It also looks like one of those baskets has more windings on it as compared to the other. 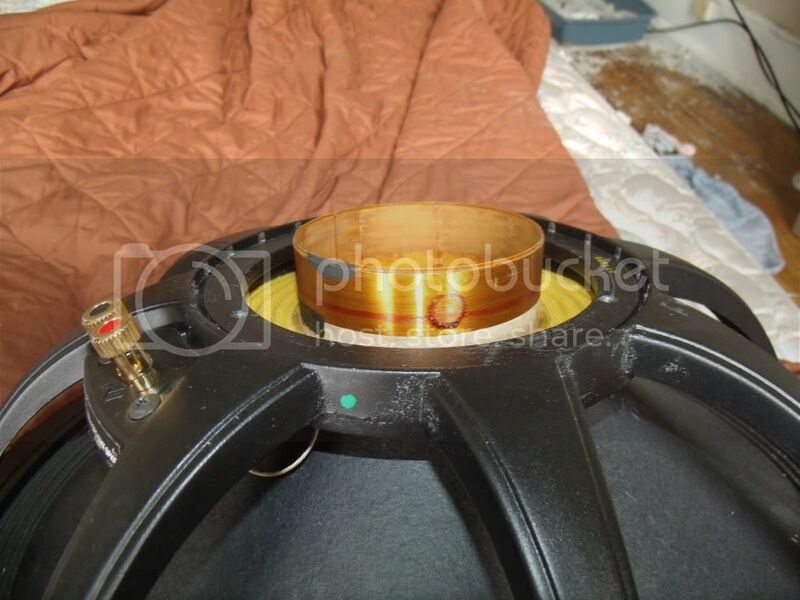 This is the P/N for a SP118 replacement basket. Are you sure you don't have a SP118X sub? They made two different version of those. One was 4 ohms and the other was 8 ohms. I can clearly see 1808-4 SPS BWX RB label on the one basket with the toasted coil. If you in fact have the non "X" SP118 subs, the wrong basket has been installed. 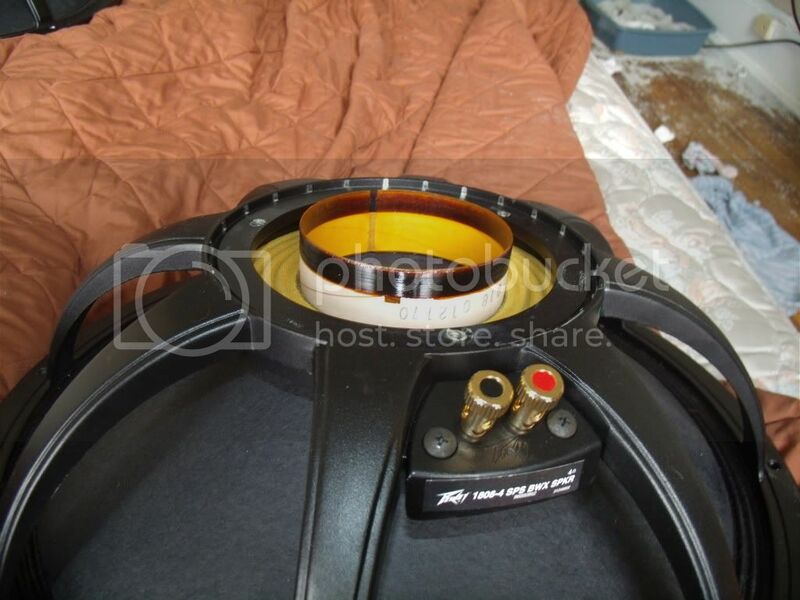 Sorry they are the sp118x subwoofers. Also the one with more windings and the circular mark has actual insulated wire from the leads to the coil and the other does not. So the coils being fried can cause them to work but pop? Sorry I'm just trying to figure this out. Anyone know the best place to get baskets? You can call PV parts department and order them yourself, or contact a local dealer and see if they have in stock. You just need to know 4 or 8 ohm. Here's the basket P/N for both the 4 and 8 ohm, the first one being the 4 ohm version. As others have said, yep, toasted coils. They can be overheated, even severely overheated, and still pass current, which is why they still produce sound(and read resistance). The motor still functions, although poorly. This type of failure is most likely caused by long term over-powering, which results in long term overheating. The coil(s) will not be able to dissipate heat as fast as it's being produced, and that's why the enamel, or other materials insulating the thin wire darkens - just like toast. You can often tell how severe the overheating is by the color of the coil- the darker, the more burnt. Eventually, they will die, and stop altogether, if they are continued to be used. In the gap where the coil slides into. There's the possibility that there's either debris in the gap, or some other oddity that caused that small burnt circle, or, just could be the result of the wrong coil installed as well. A good, though costly lesson, on using the proper limiting. Some one most likely did not know when to back off on volume, and over time, you have the result. I'm fairly sure the archives have a schlew of threads on this. Good that Tom is familiar with the proper replacement basket/coil, as I also think some one may have installed a wrong one in the one driver. You mentioned "bass exciter" in you first post. I would go easy on using that or better yet not at all. Keep in mind you only have two single 18 cabinets, they'll give you some nice thump and bump but don't expect them or make them try to do chest collapsing, pant leg blowing large room or outdoors low end. You'll need more cabinets and power to do that not a "bass exciter". 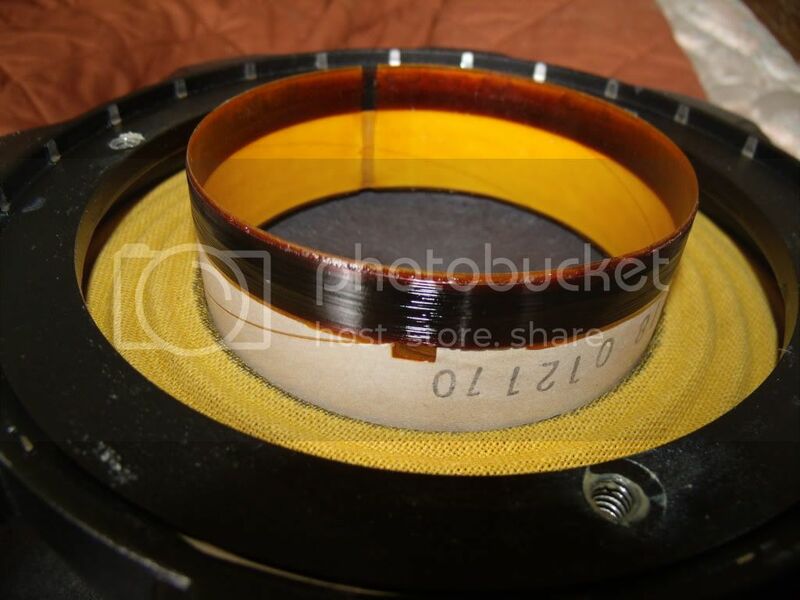 Make sure you use a high pass filter and watch for clip lights.